As of 3 June, 2012 active-duty suicides reached 154, compared with 130 in the same period last year, the Pentagon confirmed to the BBC. The number far exceeds US combat deaths for the same period. “We are deeply concerned about suicide in the military,” a Pentagon spokeswoman said, adding it was “one of the most urgent problems” they faced. While the reasons for the increase are not entirely understood, the Defence department’s own data suggest soldiers with multiple combat tours are at greater risk. But a portion of those taking their own life have never deployed, the figures show. Suicide in the forces had levelled off during 2010 and 2011, but 2012 has seen the fastest pace since the US war in Afghanistan began in 2001. 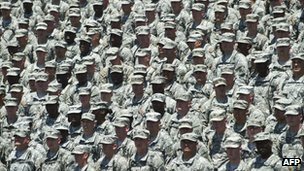 News of the suicide rate increase comes despite years of effort by the US military to encourage troops to seek help for mental health problems. Those efforts include setting up confidential telephone hotlines and placing more mental health specialists near the battlefield. But reports suggest that some in the military continue to believe that going for help is seen as a sign of weakness. Last month, Major General Dana Pittard, a commander in the 1st Armored Division, retracted an Army blog post made in January in which he told soldiers considering suicide to “act like an adult”. Gen Pittard also counselled soldiers to seek help, but his remarks drew public rebuke from top military officials, including the Chairman of the Joint Chiefs of Staff, General Martin Dempsey. Gen Dempsey said he disagreed with Gen Pittard “in the strongest possible terms”, the Associated Press reported. Pentagon spokeswoman Cynthia Smith told the BBC that “suicide prevention is first and foremost a leadership responsibility”. “Seeking help is a sign of strength,” she added.